The church was founded as an Independent chapel in 1777 and built on land leased from Sir Edward Walpole who owned Garstang at the time. [He was the second son of Sir Robert Walpole, Britain’s first prime minister.] It became a Congregational chapel in 1928 when it joined the Lancashire Congregational Union and on joining the Union of Congregational and Presbyterian churches in 1972 became a United Reformed Church. The structure has changed over the years: the four walls within which worship takes place are all that is left of the original structure. A ground floor extension was built onto the northern end of the church sometime before 1840. In 1867 the town of Garstang in its entirety was put up for auction by the Revd W A W Keppel, a great grandson of Sir Edward Walpole. Prior to the sale the trustees of the Independent chapel approached the agents acting for the Keppel estate and privately purchased the land on which the chapel stands for £100. A local newspaper reported, ‘The trustees of Garstang Independent Chapel are the first freeholders in the whole of Garstang’. As the town of Garstang reached only £78,000 at auction it was withdrawn from sale and rents were increased: this did not now concern the chapel trustees. 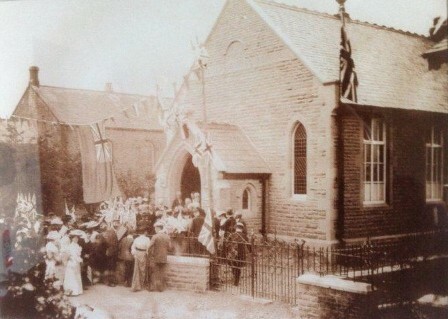 Following purchase of the freehold a full refurbishment of the chapel was carried out: the heavy stone roof was replaced with slates; an upper extension was built at the northern end; a porch was erected at the entrance; the square box-type pews were replaced by open benches; the large gallery which went around three sides of the chapel making the interior dark was replaced by a smaller one against the rear wall, and the tall pulpit at the front was replaced by a smaller one. One of the preachers of the day recalled that when preaching from the old pulpit he could shake hands with people in the gallery. In 1984 the church underwent a major restoration: the rear balcony was taken down; the pews replaced by chairs; the pipe organ replaced by an electric one; the front of the church was reorganised with the pulpit, traditionally at centre front in Nonconformist churches, was moved to the side and the communion table given a more prominent position. The earliest church register dates from 1784. The Revd Abraham Allott, minister at Forton, officiated at the first baptism. Over the years there have been 24 full time ministers, the Revd George Richardson being the first. The longest serving minister was the Revd James Grimshaw (1794 -1828) minister of the joint pastorate of Garstang and Forton. He retired from Garstang aged 86 and from Forton aged 92. 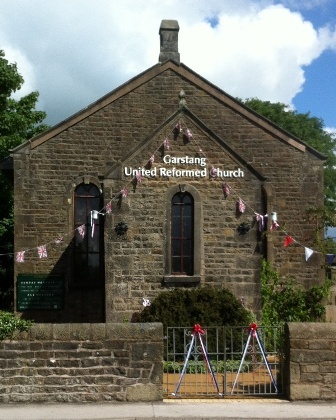 There has been co-operation between the two churches for much of Garstang church’s existence. In 1938 the two churches formed a joint pastorate, sharing the same minister but operating independently: this is the situation today. The first recorded burials were in the 1780s. Many people were buried in the churchyard, a few were buried in church and one family was buried in a vault, of which there is now no trace. An indenture of 1867 shows an outline plan of the chapel and graveyard; land to the south and east of the chapel was being used as a graveyard. It would seem that land to the east of the chapel has been used twice and the grave stones we now see actually record those people who are buried in the upper layer. The porch was built in1867 over part of the graveyard and within 20 years, due to settlement, the walls became unstable and the whole structure began to drift away from the church. Iron bolts, still in place today, were put through the porch to hold its walls together and to secure it to the church. The graveyard was then extended at both the west and north sides of the church. In the late 1800s the vestry and upper room were considered too small for the number of children attending Sunday school. It was decided a Sunday school [now the church hall] incorporating a caretaker’s cottage should be built to the east of the graveyard. Numerous fund raising events were held and land was purchased from the Keppel estate. Foundations were laid in 1903. The building was completed and opened in 1904, although the date stone gives 1903. The caretaker’s cottage has since been converted into a church kitchen and indoor toilets, the upstairs into meeting rooms. No history of the church would be complete without mentioning two of its early stalwarts: Dr William Bell and Mr Edward Cartmell, whose marble memorials at the front of the church testify to their faithfulness. Between them t hey held the position of church secretary for 80 years. Dr Bell was secretary for 41 years and was the main trustee and representative of the church. Edward Cartmell took over from Dr Bell. He was secretary for 39 years and was the senior deacon and main representative of the church. He was Sunday school superintendent for many years. On his death his son Herbert, and then his grand daughter Kath, continued as superintendents: the three Cartmells holding the post for an unbroken period of over 100 years. 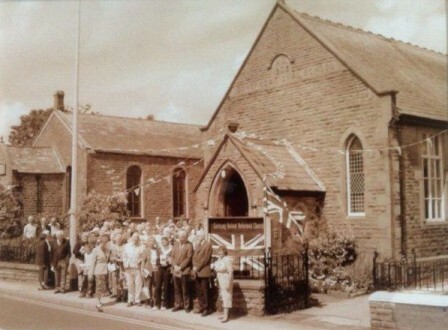 Over the past two centuries the building has changed, the people have changed, even the name of the church has changed, but Christians continue to meet regularly for worship and the precious faith which our Nonconformist forefathers established in Garstang continues to hold firm.